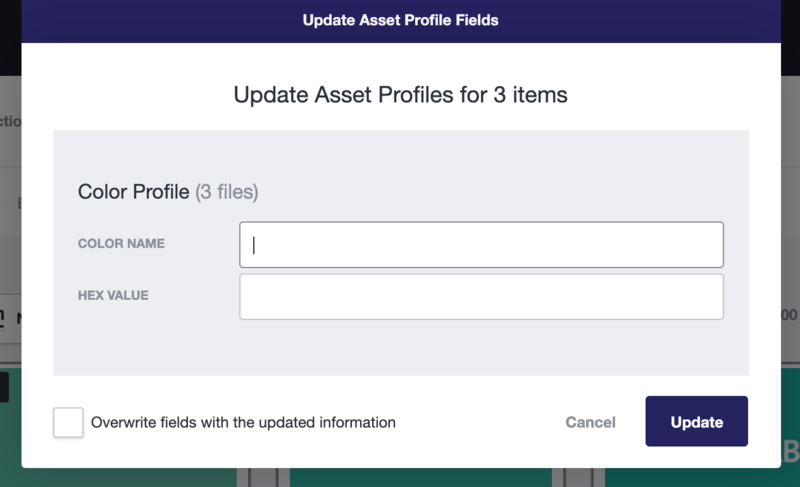 You can update the asset profile fields of multiple files or folders at once. Please note, only users with admin capabilities can edit and keyword files. Sometimes you need to update many files at once with new keywords or descriptions and our selection tool makes it easy to do that. 1. Find the files or folders that you want to update and select them by checking their box in the upper left corner of the thumbnail. 2. Click on the More options button to the right on the selection bar that appears at the top of the page. 3. Then click Update Asset Profile Fields. Please note this is different than Update Asset Profiles. 4. This will bring up a new window where you can add your new keywords or descriptions. When you are finished, click Update. Please note that you do have the option to over write any of the metadata fields with this pop up. Just check the box in the lower left to overwrite that data.